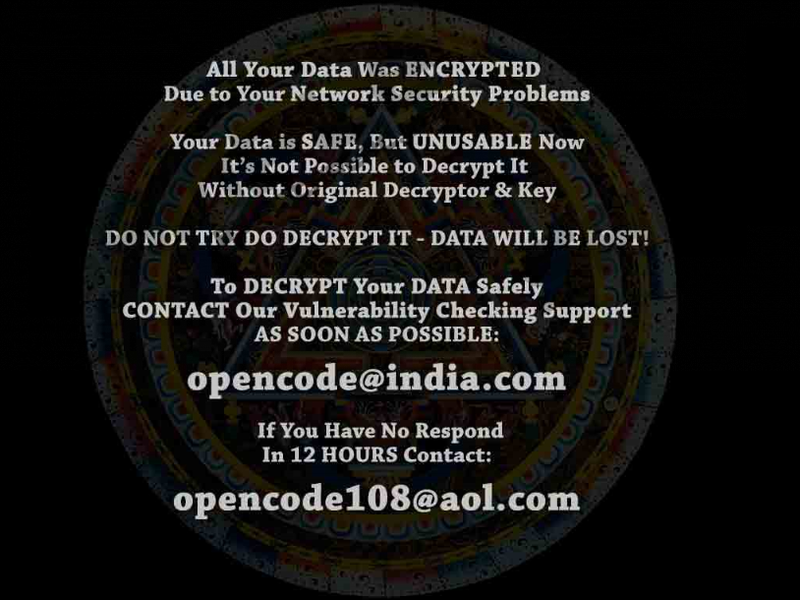 Opencode@india.com is a file-encrypting ransomware infection. If it ever finds a way to your computer, it will lock personal files and applications and thus will make it impossible to access them. It has been found that Opencode@india.com Ransomware belongs to the same family as Meldonii@india.com Ransomware, Saraswati Ransomware, and Vegclass@aol.com Ransomware, so it is not very surprising that it acts like the aforementioned infections. All the threats that are put into the category of ransomware seek to extort money from users, and Opencode@india.com Ransomware is no exception. We have to admit that it is very hard to unlock files locked by this computer infection because it uses the RSA-2048 encryption key and is based on the CrySIS Ransomware; however, it does not mean that we encourage you to pay money for unlocking those files too. The only thing we suggest that you do is to remove Opencode@india.com Ransomware ASAP. This is the necessary step if you wish to protect your future files and use the computer without fear again. Read the article to find out what you need to do eliminate it. DO NOT TRY DO DECRYPT IT – DATA WILL BE LOST! The .txt file Decryption instructions.txt containing similar text as the main ransom note will be dropped too. Specialists say that some users might also notice READ_DECRYPT DATA INSTRUCTIONS.txt on their Desktops as well. It says that “vulnerability was found in your network protection system”; however, it is not true. Your only problem is a ransomware infection that has entered your system without permission and locked all your personal files and programs. Users are not informed that they will have to pay money to decrypt their files in the ransom note; however, if you write an email to one of the provided email addresses, we are sure that you will be told to make a payment as soon as possible. The exact amount of money you will be asked to pay for cyber criminals is unknown; however, we are sure that the so-called decryptor will be expensive. Therefore, in our opinion, there is no point in contacting cyber criminals. If you have already done that and received the answer, you should not make a payment even if the required ransom does not seem to be large because cyber crooks only seek to extort money from you, and they do not care about your personal files at all. In other words, they might not unlock files for you even if you pay money. It is impossible to decrypt files free of charge at the time of writing; however, you should not delete those encrypted files with new filename extensions because the free decryptor might be developed one day. We want to provide more information about the distribution of ransomware infections. This might be useful if you wish to prevent other ransomware infections from entering your computer. According to specialists at pcthreat.com, ransomware like Opencode@india.com Ransomware are, most frequently, distributed through spam emails. The executable file of the ransomware is dropped on the computer once a user opens the spam email attachment. Undoubtedly, it can be spread somehow differently too, so we suggesting being cautious all the time if you do not want to encounter another file-locking ransomware infection. Our specialists have two pieces of advice for those users who wish to prevent malware from entering their computers: a) never open spam emails even if they look harmless and b) keep your antimalware tool enabled. If you have a security tool installed but Opencode@india.com Ransomware has managed to enter your computer, it means that it is not very effective and you should replace it with reputable antimalware software, e.g. SpyHunter. Below you will find the manual removal guide that will help to delete Opencode@india.com Ransomware. Fortunately, this computer infection does not block system utilities, e.g. Registry Editor, so it will not be that hard to erase it. If it happens that you find the manual removal method too difficult, scan your computer with a reputable antimalware scanner. All the threats will be gone from your PC after the single scan with a trustworthy tool. Launch the Windows Explorer (Win+E). Go to %WINDIR%\Syswow64 or %WINDIR%\System32. Remove the .exe file (its name will be random or something similar to Payload1.exe or Payload_c.exe). Locate the Value with the random name in HKLM\SOFTWARE\Microsoft\Windows\CurrentVersion\Run and HKLM\SOFTWARE\Microsoft\Windows\CurrentVersion\Run. Move to HKCU\SOFTWARE\Microsoft\Windows\CurrentVersion\Explorer\Wallpapers and locate BackgroundHistoryPath0. Right-click on it, select Modify, and empty the Value data. Click OK. Locate the Wallpaper Value in HKCU\Control Panel\Desktop. Right-click on it, select Modify, and clear the Value data. Quick & tested solution for Opencode@india.com Ransomware removal.